Richard K. Johnson joined the law firm in 1983. Currently, he is the managing partner of the firm. In addition to these duties, Richard maintains a busy statewide practice representing injured men and women, many of whom are union members. The unique combination of representing labor unions and individual members in work-related injury claims provides Richard the opportunity to integrate the rights and benefits of a union contract with the statutory benefits of the Illinois Workers’ Compensation Act. Maximizing these benefits for the injured work is the goal of every case. Richard has had an active role in establishing the rights of injured workers in repetitive trauma claims, handling the trial and appeal of the cases from the Commission level to the Illinois Supreme Court. In addition, Richard has written “friend of the court” briefs on behalf of injured workers who are not his clients to persuade the Appellate and Supreme Court of Illinois to award compensation benefits. This work is done through the Illinois Trial Lawyers Amicus Committee and on behalf of the United Auto Workers CAP Council. Richard does not charge fees for his “friend of the court” briefing work as he considers it his duty to give back to his profession and to the injured workers who need his help. Richard’s litigation before the Workers’ Compensation Commission has led to a number of decisions published by the Illinois Workers’ Compensation Appellate Court as well as the Illinois Supreme Court. Each of these published decisions resulted in a victory for the injured worker. Richard has successfully tried and settled cases against General Motors, Mitsubishi, General Electric, R.R. Donnelley, ThyssenKrupp and many others. In 2015 Richard Johnson was appointed to the Illinois Workers’ Compensation Rules Committee as one of only eight Illinois attorneys so appointed who represent injured workers. This committee was responsible for formulating new rules for handling claims before the Illinois Commission. This work is completed and the new rules await approval by the Illinois legislature. Richard has lectured to other lawyers at American Bar Association meetings across the country. His topics have included; how to prove a repetitive trauma claim; how to cross-examine a medical expert; and the ethics of legal solicitation and advertising. Richard has also been an expert witness on workers’ compensation issues in civil litigation. He is past vice-chairman of the American Bar Association Workers’ Compensation Committee, Tort and Insurance Practice Section; past chairman of the Chicago Bar Association Workers’ Compensation Practice Committee and a frequent lecturer for Chicago Bar Association, Illinois Institute of Continuing Education and the Illinois Trial Lawyers Association continuing legal education seminars. 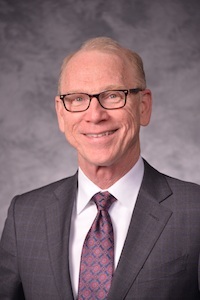 He has authored articles on workers’ compensation topics which have been published by the Illinois Institute for Continuing Legal Education, the Illinois Trial Lawyers Association and the Tort and Insurance Practice Section of the American Bar Association. In each year since 2008. 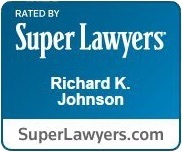 Richard has been selected by his peers as an Illinois Super Lawyer in the field of Workers’ Compensation. He has also been selected as one of the Best Lawyers in America for the past several years by his peers. He has been inducted into the College of Workers’ Compensation Lawyers and currently serves on the Board of Directors. Richard earned his Juris Doctorate from the DePaul College of Law in 1982 after receiving a bachelor of science from the School of Speech at Northwestern University in 1977. Richard K. Johnson was named by “Best Lawyers “as” 2016 Lawyer of the Year in Workers’ Compensation Law - Claimant”. Richard is “AV” Rated by his peers through Martindale-Hubbel, meaning he is considered to have the highest degree of ethics and competency in his field. In his free time, Richard enjoys hiking, snowskiing and entertaining his grandchildren.